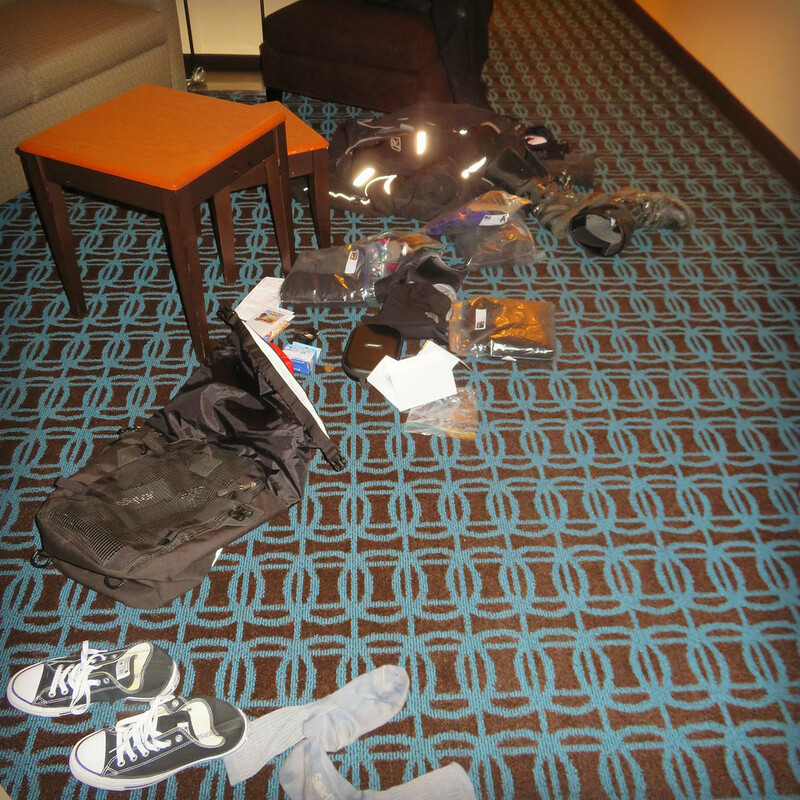 When I’m roadtripping on the bike, I do my best to pack lightly with regard to clothing. I try to pack things that are easily re-wearable, wrinkle resistant and fast drying. Fast drying is a huge help. That means I can wash them when I stop for the night and they’re dry by morning. And that means less stuff to pack. The key for me seems to be versatility. Picking clothes that I can comfortably use on the bike and still not look like a total hobo if I go to a restaurant. Also as you can see, I like black and grey. Sometimes I’ll also pack a scarf. They can smarten up a plain t-shirt or zip-up jacket when off the bike. Oh, and earrings. I feel like that’s something that helps me not feel so boyish. Gallon Ziploc bags are my best friend. They keep stuff tidy and make for easy packing. Keeping like items together keeps me from having to rifle through everything to find something. Some hotels have washing machines for guests, which is nice. That helps when your re-wearables have been re-worn many times. When you know you should be stinky but you cant smell yourself anymore? That’s when you’ve achieved a high-level of funk. Well done. In my everyday life, I hate folding clothes out of the dryer and putting them away. My motorcycle packing is kind of the antidote to that. Roll it up and stick it in a bag. If you don’t have a lot, you don’t have to take care of a lot. On the topic of motorcycle wash and wear – my friend Bill sent me this lastnight. Timely! The fact that I’m not a camper dramatically reduces the size of the stuff I need. *Only as to me — I overpack on stuff for the bike. I really pictured you as the perfect clothes folder and packer. By the way how did you like the Tiger? I’m 6′ 3″ and think it would be perfect for me except for the price tag. My plan for a new V Strom 650 went out the window recently when I sat on one. We camp off our bikes and tend to do a mix of on and off road. We’ve got our weight down to about 40kgs over the two bikes. That includes tent, camp stretchers, chairs, exped mats, sleeping bags (and pillows – very important), cooking gear and clothes. It took us a bit of trial and error but I found a decent night sleep makes all the difference when you’re travelling more than eight hours a day. Having said all that, I love it when we stay in motels and eat non-freeze dried food . They are really handy. Try amazon! Exactly my packing philosophy: lots of wicking, quick dry stuff, and a couple of off bike tops, and always, earrings so I don’t look like a boy. But the scarf is a really good idea…I need to try that.